Janet Campbell Hale, Coeur d'Alene, was born in Riverside, CA. Her father was a full blood Coeur d'Alene and her mother was Kootenay/Cree/Irish. She spent part of her childhood on the Coeur d'Alene and Yakima reservations, attending high school in Wapato, WA. Ms. Hale attended City College of San Francisco for a year before transferring to the University of California at Berkeley where she graduated in 1974 with a degree in rhetoric. She then studied law at UC Berkeley for 2 years. Ms. Hale later returned to graduate school at the University of California at Davis where her M.A. thesis in English was the novel The Jailing of Cecelia Capture . Also an artist, Ms. Hale painted the cover for her forthcoming book of short fiction, Women on the Run . She is currently painting a mural at the Coeur d'Alene Tribal School. Ms. Hale has held faculty positions at colleges and universities across the country. 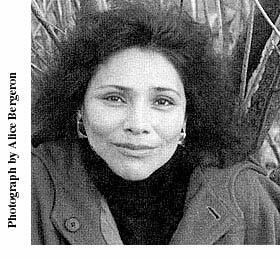 She has taught at Northwest Indian College, in Bellingham, WA, held positions as Writer-in-residence at the University of Oregon, Eugene, as Visiting Distinguished Writer at the University of Washington, Seattle, Eastern Washington University in Cheney, the Institute of American Indian Arts in Santa Fe, and the University of Idaho, Moscow, as Thornton Writer at Lynchburg College, Lynchburg, VA, and, most recently, as Visiting Professor of Native American Literature at the University of California at Santa Cruz. She has held the Richard Thompson Lectureship at Iowa State University, Ames and the Claremont Lectureship at the College of Illinois. Ms. Hale is currently living on the Coeur d'Alene reservation in Desmet, ID. The Janet Campbell Hale site on Voices in the Gaps is available. Excerpt from Bloodlines: Odyssey Of A Native Daughter , from the University of Arizona Press. The Jailing of Cecelia Capture was nominated for a Pulitzer Prize in 1985 and was first runner-up for the Great Lakes Association of Colleges Book Award and first runner-up to Lonesome Dove for the Western Writers of America Book Award. Bloodlines: Odyssey of a Native Daughter was a winner of the 1995 American Book Award in Creative Non-fiction. Ms. Hale has received a National Endowment for the Arts, Fellowship in Creative Writing in 1995, a Carnegie Authors Fund grant in 1997, a Idaho Commission on the Arts Fellowship in Creative Writing in 1998, a McNickle Research Fellowship at the The Newberry Library in Chicago in 1984. Earlier awards include The Vincent Price Poetry Award in 1964 and First Place in the New York Poetry Day Award in 1965. Bloodlines : Odyssey of a Native Daughter , University of Arizona Press. First published by Random House; followed by HarperCollins. The Owl's Song , University of New Mexico Press. First Published by Doubleday in 1974. In print since then in editions by Avon, Bantam and HarperCollins. The Jailing of Cecelia Capture , University of New Mexico Press. First published by Random House. To be a Book of the Month Club selection in May, 1999. Janet Witalec, Visible Ink Press. Joseph Bruchac (Editor), Greenfield Review Press. Dexter Fisher, Houghton Mifflin Co.
Janet Campbell Hale , Frederick Hale, Boise State University. Parole nel Sangue: Poesia indiana americana contemporanea , Mondadori, 1991. Freundschaft Mit Der Erde , Herder & Company, Wein, Austria, 1987. © 1999 Janet Campbell Hale and Karen Strom.